In June of 1992, Victor Papanek delivered an insightful talk while visiting Apple Computer, entitled Microbes in the Tower. Papanek asked his audience to make sense of the “jigsaw puzzle pieces” of his lecture by integrating the content into their interests, learning needs, and context. Victor emphasized the importance of including people, their voice, and needs in the decision-making processes. He declared the biggest challenge was the need to develop a language and methodology to facilitate the inclusion of people within the design process. 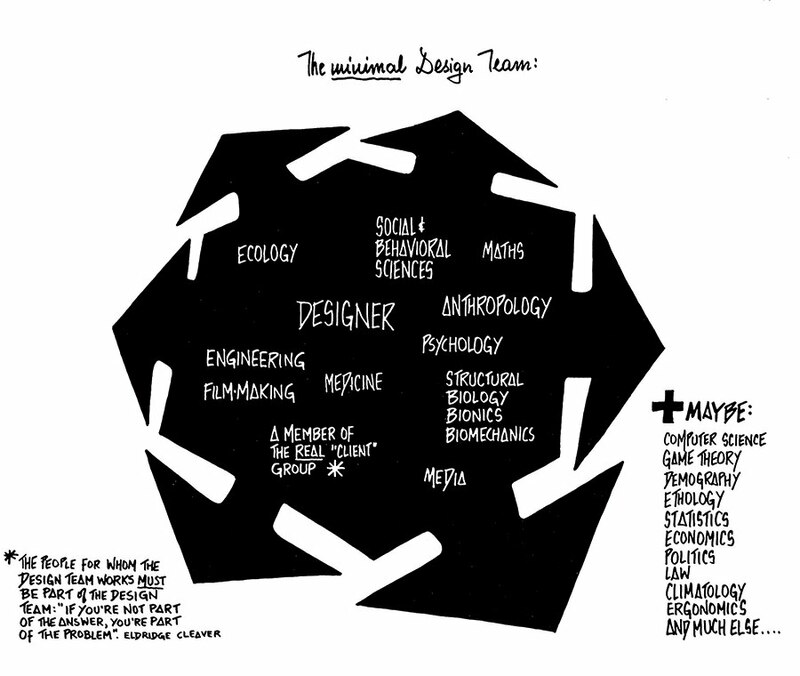 Design teams should be made up of a diverse set of disciplines, including a member of the “client” group in question, the people who the team is designing for. Source: University of Applied Arts Vienna/Victor J. Papanek Foundation. The image above depicts Victor Papanek’s belief that designers should take on a broader role as co-facilitators of the creative process. This aspect of his work was included in the retrospective Victor Papanek: The Politics of Design at the Vitra Design Museum; described Victor as the forward-thinking designer who anticipated the social-design movement by decades.